I used this very often for three years and then infrequently for the next eight years. It worked great. Bivy use has its pros and cons, but I will leave all that to the experts and just tell what I know about this product. I used this with a poncho tarp as my primary shelter for three years of hard use. It was great. The only issue I had was condensation in temps below 20 F degrees in the Southeast. I took my Western Mountaineering Alpinlite down to 9 degrees with this bivy and, it was cold, but doable. I think the bivy added 10 degrees to the bag rating. The floor of this bivy is heavy duty. I never had any fear of it leaking. I even camped in the middle of the trail once and rain water gushed under me all night, but I remained dry. I slept in the rain and snow with no tarp over me many times with no issues. It kept the wind at bay on some stormy nights. Having a shelter footprint the size of your body is really nice. Easy entry and exit. Zippers are top knotch and easy to operate. The foot zip can stay open in the rain as long as splahing from ground water is not an issue. The hood zipper can also remain partially open in heavy downpours as long as ground splash is controlled. I used this under a Golite poncho for the most part. The combo made a light and bombproof shelter. After many years of use I sent it back to OR to see if they could repair the inner coating on the floor. They could not, but graciously offered to refund the current price or replace it if I wished. I figured I got my use out of it, but that kind of warranty is rare. Thanks for the review of your bivy, hootyhoo. It sounds like it served you well. If you have any pictures of it, it would be helpful to see them in your review. You mentioned weight as a con. How much does it weigh? Ease of Setup: Relatively easy. This bivy is a 3-layer JGI 1.1 oz. Gore-Tex fabric upper section for maximum vapor transport, 1.7 oz. taffeta, complete with bombproof Hydroseal-200 coated floors, and every seam completely taped with Gore-Seam tape for total waterproofness. Pole Height = 19 inches. The sack is MADE IN U.S.A. The "go lighter bug" has bitten me. (Not to the extent that my five day pack weighs sub 14 pounds, but it has bitten me nonetheless.) I read magazine articles, surfed the web, browsed bookshelves, talked to experienced backpacker and mountaineering friends and trailmates, and decided that my stuff weighed too much to lug most of the time through the Rockies. I let it sink in for about a year. Earlier in the season I gathered my gear, stood over it, and began to ponder which of my necessary, recommended, and too often expensive gear was in direct conflict with my quest to go lighter. My TFN tent, weighing in at approximately six and a half pounds packed, stuck out immediately. It's a great tent, don't get me wrong. It has served me well, and still will on occasion no doubt. Especially when my wife ventures out with me. It is just that I couldn't help but think that I could replace it with a lighter alternative, saving at least a couple of pounds. So I began researching smaller, lighter tents. I scaled back and sized down, shaving ounces here and there. There are some great lightweight tent options out there, but I though as long as I'm looking into lightweight tents, I should look into the lightest weight shelters available. Which eventually brought me to bivy sacks. 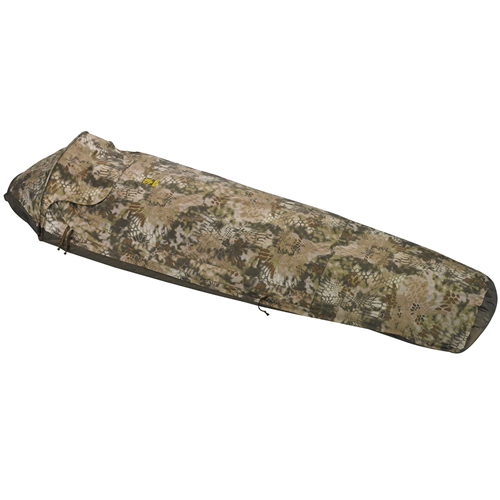 Looking at biviy sacks, I eventually found the OR Advanced Bivy. Actually, it found me first, thanks to a guy on a trail earlier in the Rockies. He was nestled between two boulders just off the trail, in a place no tent could have hoped to have fit. I stopped, chatted, then moved further along in search of a local better suited for pitching my shelter. I made a mental note to check into it after the trip. 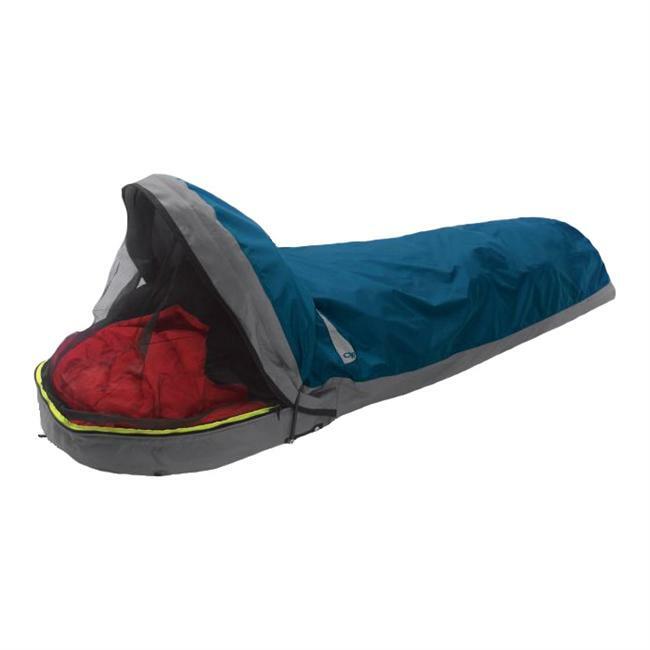 The OR Advanced Bivy is distinquished from other bivies on the market by its clever clamshell opening. This opening is achieved by using two poles, and allowes the top (including the bug net) to range from closed to approximately 90 degrees. Ever used a bivy that lays on your face or barely above it? I have. Ugh. Never again. Nice evening? Open her all the way up and stare at the stars. Storming out? Close her up and stay dry. WARNING: You should never close a bivy all the way. Always leave a couple of inches open to promote air flow. The design allows for this. You will still remain dry. "Breathable" is a relative term, after all. As with any bivy sack, space is limited, and about the only thing that you can do in it is sleep. I'm 6 feet tall and weight about 195 pounds. I can fit a sleeping pad, a four season bag, and a few necessities inside and sleep comfortably. Tossers and turners probably will not claim the same. Changing clothes can be tricky. Practice before your first use. Actually, practice before you buy, if you can. A friend of mine loves the concept, but hates the reality. It isn't for everyone. If more space is something you crave, or "need," then step up in weight and size to a one man tent. You heard it here: Claustrophobes and clumsy folk beware! OR gear has a reputation of being bombproof. OR bivies, and the Advanced Bivy in particular, have been around for years, and I have yet to have heard or read about one wearing out. For that matter I haven't heard mention of any of their gear wearing out in less than reasonable timelines. Setup is easy. You simply roll it out, slide in the poles, and add your pad, bag, and body. The pad is held in place by two velcro straps inside. A nice touch, but I'm not convinced that they are necessary. You should be done in at least half of the time it takes to set up the average free standing tent. So, if you have been thinking about saving the significant space and weight that a bivy sack affords, and aren't detered by needing more space, place the OR Advanced Bivy on your short list of possible purchases. I own the OR Advanced Bivy, which I purchased at REI in 2003. I LOVE it! It came with me on a four-week backpack of the Hotsprings Trail in Central Idaho (Frank Church River of No Return Wilderness). On this trip, I used it inside the REI Quarter Dome for a few more degrees of temperature warmth, and rolled the whole shebang up (plain blue foam sleep pad, 0 degree bag, bivy), and strapped it to the bottom of the pack inside a black plastic bag. It really helped keep this girl warm and comfortable! (I know it seems redundant, but I will always carry extra weight, GLADLY, to stay warm at night!). I mostly just camp during the shoulder seasons (early spring and late fall, when there are less people and less mosquitoes). A couple of nights, I lent the bivy to friends who met us on the trail, and I regretted it and tossed and turned with cold. So, as an addition to a sleep system for a cold sleeper the Advanced Bivy is a huge plus! The second way we used the Advanced Bivy was for its original design—as an independent tent during summer hikes—so we could go ultralight! Now I don't get to use my bivy anymore because my 11 year old has commandeered it! Hah! ...soooo... we are in the market for a second one! LOL! The inner lining has gotten kind of sticky over time, but zippers have held up, seams are all intact... probably over 100 sleeps in the bivy and it is still one of my favorite pieces of gear. I didn't experience any issues with condensation or have any trouble finding places to put it in my pack. For something purchased in 2003 I am mighty impressed. Welcome to Trailspace, Angie! Thanks for the review. It's always great to hear about gear that has held up so well and is well used. Do you have any pictures of your bivy you'd be willing to show others in your review? p.s. I totally understand about prioritizing staying warm at night. Does show a little wear after 6 years and roughly 100 nights. Simple abrasion marks on the outer floor are visible, but have shown to have no effect to the overall performance. My concern relates mainly to the internal bug net zipper. Overtime it has "burned" itself out. I am a firm believer that nothing is waterproof so it was no surprise that during a torrential rain storm in Virginia's Jefferson NF that I ended up with a damp sleeping bag near the footbox. Also, condensation is apparent when used outside of the dry air of the Southwest. At its peak height there is plenty of room to shuffle around and stave off the effects of claustrophobia and keep some sense of sanity. There are also three positions that you can set the poles at to keep the flow of air moving as well as protect yourself from the elements. It is light enough to bring on day hikes in hostile terrain (ie. Tetons, Winds or Alps) and with it weighing in under 2 lbs it is definitely more preferable to pack than a two man tent. I think the bug net is a great idea, but it always seems to get in the way as I am entering and exiting. Of the 100 or so times I have used my bivy, I have set it up completely about 10 - 15 times. The poles can get confusing at times (and remember, there are only 2 of them) and trying to find the sleeves to slide them through at night is almost impossible. With a little practice it gets easier, but when you are exposed on a col with a storm barreling down - sliding those plastic poles through those tight sleeves is quite daunting. I traded my tent in years ago for the simplicity and no frills aspects of a bivy and thanks to the Advanced Bivy, I may never look back. This is a very well constructed bivy. Lightweight and when the cover is kept open there is no condensation. I used this bivy on the Northville-Placid Trail in the Adirondacks. Excellent protection. Overall, if you're interested in buying a bivy, I'd spend the money and get an Advanced Bivy from Outdoor Research. Welcome to Trailspace, Robert. Can you tell us more about your bivvy and what you like about it? Sturdy and spacious (for a bivy). I've used this bivy while solo hiking and camping and love its stealth properties. I wouldn't buy a bright yellow or fluorescent orange bivy, because I want to be able to fly under the radar, and this bivy's subdued color helps me do that. I love the little storage pocket, which is a great way to stash my glasses. If you're at all concerned that a bivy might be too claustrophobic of an experience for you, this bivy is a great way to put those fears to rest. There's plenty of headroom, due to the two-pole setup at the head. Like most things in life, there's a tradeoff: the two-pole system takes a few extra minutes of time to set up (not a problem in good weather, but aggravating in the rain), and it adds to the weight and price of the bivy. My chief complaint about the two-pole system is that the upper pole doesn't stay propped open when you want it to. This bivy excels in bad weather, when you don't want the upper pole propped open, but it can be distracting on nice nights, when you want fresh air and stars, but need the bug protection that the mosquito netting provides. All this said, I love this bivy and recommend it for people who are uncertain that a bivy is the right way to go. I just sent my old Advanced Bivy back for warranty because the seam tape had come loose around the base of the poles. Without comment, they sent me a brand new one... WHICH IS 10 OUNCES HEAVIER! The new spec weight (April 2008) is 39 ounces, not the 28 ounces of my old one and the even lighter weight mentioned in other reviews. There are now several stiffeners around the zipper opening, and a new foot zipper, but the increase in weight means you are in the range of one-man tents now. Bummer. I loved my old bivy, and used it year-round for quite a while. Outdoor Research's warranty can't be beat, but the replacement isn't really in the same category as the original. I've used this bivy for eight years, probably spent at least 130 nights in it. It is a testament to the design that OR has not really changed anything on this sack since it came out in the early '90s. I've not ever had to repair it. It's kept my down bag dry in 2-day downpours and warm in the snow. Condensation isn't a problem if vented properly. I usually use a 4'x8' tarp over the head area. I can't say enough about this sack. If mine ever wears out I will buy another one even though the price has gone up considerably. The Outdoor Research Advanced Bivy Sack holds up to all weather conditions (in the mid east). I've used it in the dead of winter in the Appalachian trails as well as the summer. It is 100 percent waterproof and windproof. It is lightweight and takes up a minimal amount of space in your pack. It comes with two poles that snap into the sack for an overhead awning and a pole for the bottom. This opens up the front of the sack allowing for more shoulder and head space. Although, the sack tapers down to the feet and it gets quite tight. It has good ventilation if you keep the hood open. It you shut the hood you will get some condensation, which is the only drawback. It is a tight squeeze, I am 5'10" and weigh 150lbs and I had just enough room. There isn't much space for tossing and turning. 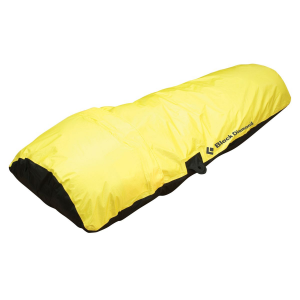 Although you can fit in a full length sleeping bag and it even has straps for your sleeping pad. It's difficult to get in and out of, but that will be the case with any bivy sack. It offers great protection from the snow, wind and rain. This is the tent to buy for solo nights and extreme weather conditions. Although it's quite expensive, the quality and craftsmanship is excellent. Weight: mine is 1 lb. 3 ozs. Cut the velcro, the bottom one. It is supposed to hold your pad, mine did no good. Just added weight and trouble. Also, I don't carry the bug screen most of the year. Sometimes I don't carry the long pole either and I have trimmed a few other "extras" off it. It can be set up in about 2 min. after you learn one pole is longer than the other. Throw pad in, throw bag in, climb in and pull pack in. In cold weather I cook with one arm outside me in my bag and sac. 1. Weight, try to find a better, lighter shelter. 4. Size, less than 2' at the tallest peak and skinny, puts up anywhere. ~For all this I did have to give up my right arm. The price is no joke. Test it, try it, get in, get out, (it takes gettin' used to.) pack it, unpack it. You can't sit up in it, you can roll over in it. I borrowed an OR Advanced Bivy from a friend for two separate trips. The first trip was an eye opener. I thought the bag was not so easy to set up: the poles are not shock corded, I didn't know which pole went where, and the bug screen wasn't zipped in. After I figured out the poles and bug screen, I shimmied into the bag, and spent the night waking up to find the "clamshell" opening had fully closed, leaving me without some fresh air getting in the bag. The second use was easier as far as set up, but again, the opening kept closing up, leaving me with no fresh air. In short-I don't like the design because the top keeps closing up on me, and I didn't care to shimmy down into the sack every time I had to get up after drinking too much tea before going to sleep. I'm glad I didn't buy the OR. I like the design of the Integral Designs bivy bags--zipper on the side, opening above the head instead of at the end of the bag. I've used this bivy sac for about four years (when they first became available) about 5-10 nights/year. Setup: The hoop poles are difficult to snap in place with cold hands. The pole sleeve seams have separated (I've had to resew them). Water shedding qualities: The gore-tex top half works well. The "coated nylon" basin (bottom half) leaks badly due to the coating rubbing off when encountering friction from sleeping pad, flashlight, or even simply being stuffed. This coating is definately inferior material -- you folks that use this bivy for a couple of seasons will find out like I did. Miscellaneous: When zipped up inside using the mosquito netting, the zipper can only be accessed from the OUTSIDE. This engineering oversight makes getting out a pain. This sounds picky, but I guess paying $250 for a bivy sac should entitle me to near perfection. Weight: 1 lb. 10 ozs. First of all, I din't pay full price, I bought it at a "Gear Grab." I looked for this model in particular because a couple of other bivy sacks I had tried rested on my face at night, which I couldn't stand! 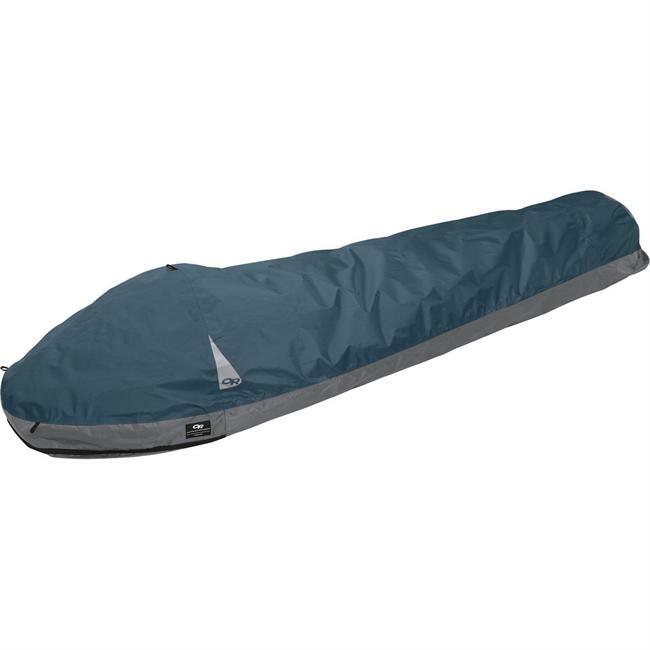 The OR Advanced Bivy is super light, packs very easy, and sets up with little difficulty. The only set up problem involves remembering which of the two poles goes in which position. Once that mystery is solved (it does come with directions, but hey, I'm male!) it is very easy to get in and out of. One of the features I like is the straps in the sack that hold your mattress in place. Also, in reference to the pole set issue, it allows for, depending on your preference and the weather, for the opening to be left fully or partially open, with a net, or can be closed fully. One problem, not unique to this bivy sack, is that in the fully closed position, condensation does occur, fairly heavily. Other than that, I've used this for anywher from solo summer overnighters, to winter snow camping, and it has worked very well.